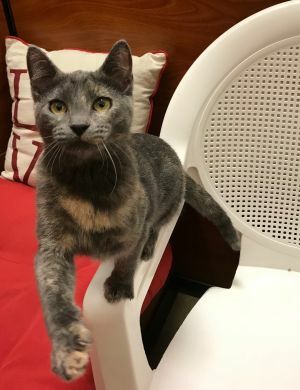 Bonaire is a beautiful girl who loves pets and scritches!! Her sister Aruba and she love to play, chase toys, and snuggle together! She would do well with cat-friendly dogs, other cats, or school-age or older kiddos! *If you are reading this, I am still available! 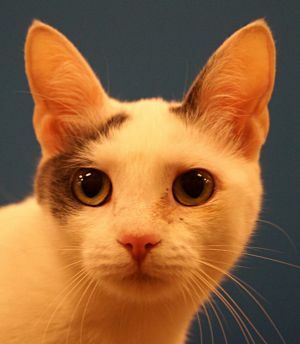 Please contact us to set up a time to see Bonaire as she is not at Petsmart Lewisville every weekend* The adoption fee is $150 for kittens up to 1 year old, and $125- $75 for adults (depending on age). The adoption fee covers FIV/FeLeuk testing (all cats must test negative to be adopted), 2 rounds of FVRCP and FeLeuk vaccinations, rabies, and (age appropriate) spay/neuter surgery (if not sterilized before they are adopted), deworming, treatment for ear mites (if applicable), nails trimmed and have been bathed. We also offer courtesy nail trims every weekend. Our associated vet list consists of 10 vets within the DFW area for your convenience. Lost Paws offers same day adoptions on the weekend (check our website for locations and times). We offer a Foster to Adopt (trial) program; half the adoption fee the day the kitten/cat goes home and the balance 2 weeks later. We do not ship our cats. Through the week, we will set up an appointment to meet with an approved application and at the foster parents convenience (we all have F/T jobs too). If you are interested please email Siamesekatdiva@gmail.com or text 817.891.3909 giving detailed information (name or tag #) of the interested feline(s) and we will respond back to you within 24 hours. For Serious Inquiries please go online to lostpawsrescueoftexas.org and fill out an adoption profile (under forms tab) and email it back to Siamesekatdiva@gmail.com. We give priority to completed applications. 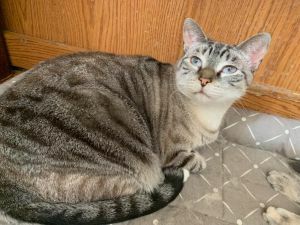 Cosmo is a lovey dude who likes cat nap cuddles and following his foster mom around the house! He enjoys playing and considers most anything a toy- plastic straws, paper, and his personal favorite, plastic bottle caps! He likes carrying them around everywhere. 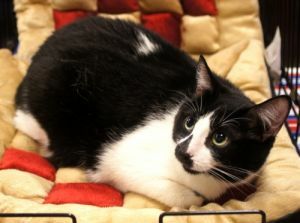 Cosmo will need a buddy and would be good with a male kitty (he would love being adopted with his brother Aster!). He would be fine in a home with cat friendly dogs and children! *If you are reading this, I am still available! Please contact us to set up a time to see Cosmos as he is not at Petsmart Lewisville every weekend* The adoption fee is $150 for kittens up to 1 year old, and $125- $75 for adults (depending on age). The adoption fee covers FIV/FeLeuk testing (all cats must test negative to be adopted), 2 rounds of FVRCP and FeLeuk vaccinations, rabies, and (age appropriate) spay/neuter surgery (if not sterilized before they are adopted), deworming, treatment for ear mites (if applicable), nails trimmed and have been bathed. We also offer courtesy nail trims every weekend. Our associated vet list consists of 10 vets within the DFW area for your convenience. Lost Paws offers same day adoptions on the weekend (check our website for locations and times). We offer a Foster to Adopt (trial) program; half the adoption fee the day the kitten/cat goes home and the balance 2 weeks later. We do not ship our cats. Through the week, we will set up an appointment to meet with an approved application and at the foster parents convenience (we all have F/T jobs too). If you are interested please email Siamesekatdiva@gmail.com or text 817.891.3909 giving detailed information (name or tag #) of the interested feline(s) and we will respond back to you within 24 hours. For Serious Inquiries please go online to lostpawsrescueoftexas.org and fill out an adoption profile (under forms tab) and email it back to Siamesekatdiva@gmail.com. We give priority to completed applications. Curaco is a beautiful boy who is friendly and loves getting his attention fixes! He does like to play but is also a laid back kinda guy. He would do well with cat-friendly dogs, cats, or school-age or older kids! *If you are reading this, I am still available! 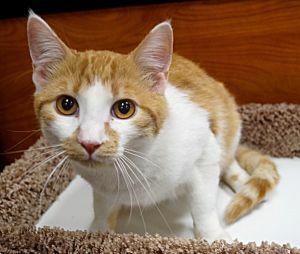 Please contact us to set up a time to see Curaco as he is not at Petsmart Lewisville every weekend* The adoption fee is $150 for kittens up to 1 year old, and $125- $75 for adults (depending on age). The adoption fee covers FIV/FeLeuk testing (all cats must test negative to be adopted), 2 rounds of FVRCP and FeLeuk vaccinations, rabies, and (age appropriate) spay/neuter surgery (if not sterilized before they are adopted), deworming, treatment for ear mites (if applicable), nails trimmed and have been bathed. We also offer courtesy nail trims every weekend. Our associated vet list consists of 10 vets within the DFW area for your convenience. Lost Paws offers same day adoptions on the weekend (check our website for locations and times). We offer a Foster to Adopt (trial) program; half the adoption fee the day the kitten/cat goes home and the balance 2 weeks later. We do not ship our cats. Through the week, we will set up an appointment to meet with an approved application and at the foster parents convenience (we all have F/T jobs too). If you are interested please email Siamesekatdiva@gmail.com or text 817.891.3909 giving detailed information (name or tag #) of the interested feline(s) and we will respond back to you within 24 hours. For Serious Inquiries please go online to lostpawsrescueoftexas.org and fill out an adoption profile (under forms tab) and email it back to Siamesekatdiva@gmail.com. We give priority to completed applications. 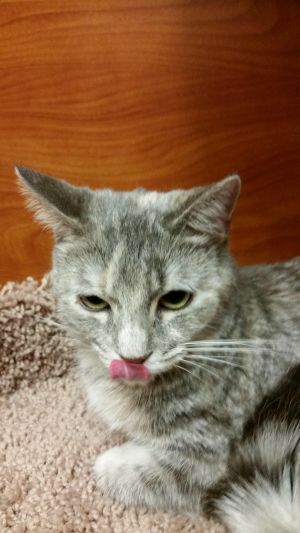 Duchess is a sweet and lovable girl who likes to play and is looking for her furrever home. 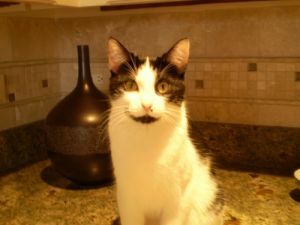 She would be purrfect as a little girl's BFF and is not only cat friendly but would be fine with cat friendly dogs too! Consider taking her home under our foster to adopt program! *If you are reading this, I am still available! 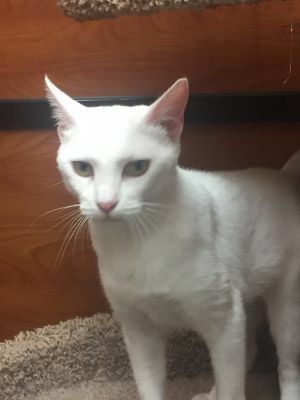 Please contact us to set up a time to see Duchess as she is not at Petsmart Lewisville every weekend* The adoption fee is $150 for kittens up to 1 year old, and $125- $75 for adults (depending on age). The adoption fee covers FIV/FeLeuk testing (all cats must test negative to be adopted), 2 rounds of FVRCP and FeLeuk vaccinations, rabies, and (age appropriate) spay/neuter surgery (if not sterilized before they are adopted), deworming, treatment for ear mites (if applicable), nails trimmed and have been bathed. We also offer courtesy nail trims every weekend. Our associated vet list consists of 10 vets within the DFW area for your convenience. Lost Paws offers same day adoptions on the weekend (check our website for locations and times). We offer a Foster to Adopt (trial) program; half the adoption fee the day the kitten/cat goes home and the balance 2 weeks later. We do not ship our cats. Through the week, we will set up an appointment to meet with an approved application and at the foster parents convenience (we all have F/T jobs too). If you are interested please email Siamesekatdiva@gmail.com or text 817.891.3909 giving detailed information (name or tag #) of the interested feline(s) and we will respond back to you within 24 hours. For Serious Inquiries please go online to lostpawsrescueoftexas.org and fill out an adoption profile (under forms tab) and email it back to Siamesekatdiva@gmail.com. We give priority to completed applications. Katsura is a quiet girl who likes to take everything in before she jumps in to play. 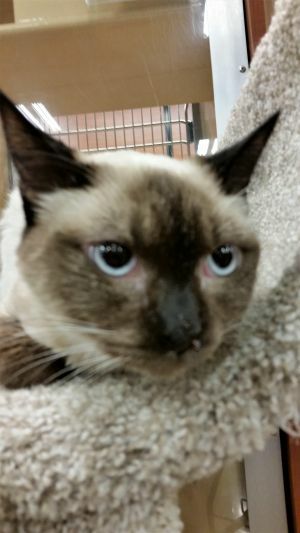 She would do well being adopted with her mom Willow, another Siamese kitty, or a calm cat friendly dog. Katsura would do best in a home without young children. *If you are reading this, I am still available! 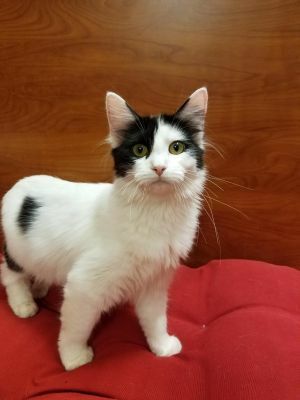 Please contact us to set up a time to see Katsure as she is not at Petsmart Lewisville every weekend* The adoption fee is $150 for kittens up to 1 year old, and $125- $75 for adults (depending on age). 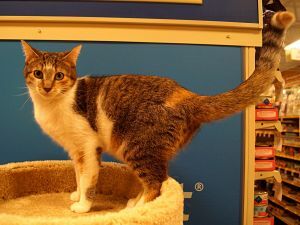 The adoption fee covers FIV/FeLeuk testing (all cats must test negative to be adopted), 2 rounds of FVRCP and FeLeuk vaccinations, rabies, and (age appropriate) spay/neuter surgery (if not sterilized before they are adopted), deworming, treatment for ear mites (if applicable), nails trimmed and have been bathed. We also offer courtesy nail trims every weekend. Our associated vet list consists of 10 vets within the DFW area for your convenience. Lost Paws offers same day adoptions on the weekend (check our website for locations and times). We offer a Foster to Adopt (trial) program; half the adoption fee the day the kitten/cat goes home and the balance 2 weeks later. We do not ship our cats. Through the week, we will set up an appointment to meet with an approved application and at the foster parents convenience (we all have F/T jobs too). If you are interested please email Siamesekatdiva@gmail.com or text 817.891.3909 giving detailed information (name or tag #) of the interested feline(s) and we will respond back to you within 24 hours. For Serious Inquiries please go online to lostpawsrescueoftexas.org and fill out an adoption profile (under forms tab) and email it back to Siamesekatdiva@gmail.com. We give priority to completed applications. Maui is a sweet love bug who likes to cuddle! 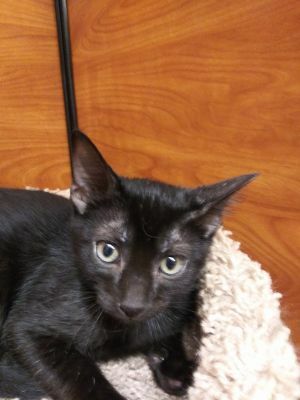 He would do well being adopted with his sister Moana, or to a home with another young male cat for him to play with! He would be fine with older children (school aged). *If you are reading this, I am still available! Please contact us to set up a time to see Maui as he is not at Petsmart Lewisville every weekend* The adoption fee is $150 for kittens up to 1 year old, and $125- $75 for adults (depending on age). The adoption fee covers FIV/FeLeuk testing (all cats must test negative to be adopted), 2 rounds of FVRCP and FeLeuk vaccinations, rabies, and (age appropriate) spay/neuter surgery (if not sterilized before they are adopted), deworming, treatment for ear mites (if applicable), nails trimmed and have been bathed. We also offer courtesy nail trims every weekend. Our associated vet list consists of 10 vets within the DFW area for your convenience. Lost Paws offers same day adoptions on the weekend (check our website for locations and times). We offer a Foster to Adopt (trial) program; half the adoption fee the day the kitten/cat goes home and the balance 2 weeks later. We do not ship our cats. Through the week, we will set up an appointment to meet with an approved application and at the foster parents convenience (we all have F/T jobs too). If you are interested please email Siamesekatdiva@gmail.com or text 817.891.3909 giving detailed information (name or tag #) of the interested feline(s) and we will respond back to you within 24 hours. For Serious Inquiries please go online to lostpawsrescueoftexas.org and fill out an adoption profile (under forms tab) and email it back to Siamesekatdiva@gmail.com. We give priority to completed applications. 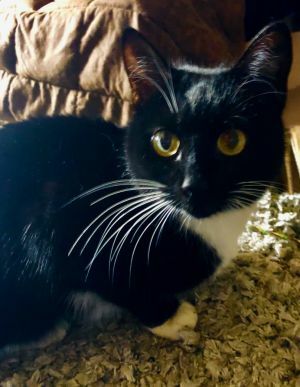 Missy is a sweet and loving girl that cares far more for attention and chin scritches than playing. She is comfortable in her foster home with both cats and a cat-friendly large dog. *If you are reading this, I am still available! Please contact us to set up a time to see Missy as she is not at Petsmart Lewisville every weekend* The adoption fee is $150 for kittens up to 1 year old, and $125- $75 for adults (depending on age). The adoption fee covers FIV/FeLeuk testing (all cats must test negative to be adopted), 2 rounds of FVRCP and FeLeuk vaccinations, rabies, and (age appropriate) spay/neuter surgery (if not sterilized before they are adopted), deworming, treatment for ear mites (if applicable), nails trimmed and have been bathed. We also offer courtesy nail trims every weekend. Our associated vet list consists of 10 vets within the DFW area for your convenience. Lost Paws offers same day adoptions on the weekend (check our website for locations and times). We offer a Foster to Adopt (trial) program; half the adoption fee the day the kitten/cat goes home and the balance 2 weeks later. We do not ship our cats. Through the week, we will set up an appointment to meet with an approved application and at the foster parents convenience (we all have F/T jobs too). If you are interested please email Siamesekatdiva@gmail.com or text 817.891.3909 giving detailed information (name or tag #) of the interested feline(s) and we will respond back to you within 24 hours. For Serious Inquiries please go online to lostpawsrescueoftexas.org and fill out an adoption profile (under forms tab) and email it back to Siamesekatdiva@gmail.com. We give priority to completed applications. I am a cuddly cat who loves attention! I love to be pet on the head and right behind the ears. I love my brother Dean and can be seen with him most of the time, but when I'm not with him I'm off exploring the house! 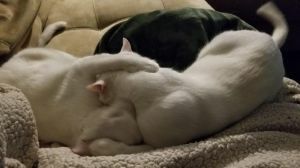 I don't really like dogs or other cats besides my brother, but I make up for that with cuddles! I'm quiet at first, but give me a chance and you won't regret it! I need to be placed in a home with my brother Dean as we are bonded. *If you are reading this, I am still available! Please contact us to set up a time to see Sam as he is not at Petsmart Lewisville every weekend! * The adoption fee is $150 for kittens up to 1 year old, and $125- $75 for adults (depending on age). 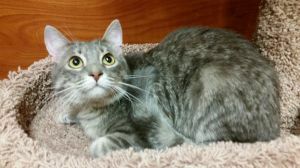 The adoption fee covers FIV/FeLeuk testing (all cats must test negative to be adopted), 2 rounds of FVRCP and FeLeuk vaccinations, rabies, and (age appropriate) spay/neuter surgery (if not sterilized before they are adopted), deworming, treatment for ear mites (if applicable), nails trimmed and have been bathed. We also offer courtesy nail trims every weekend. Our associated vet list consists of 10 vets within the DFW area for your convenience. Lost Paws offers same day adoptions on the weekend (check our website for locations and times). We offer a Foster to Adopt (trial) program; half the adoption fee the day the kitten/cat goes home and the balance 2 weeks later. We do not ship our cats. Through the week, we will set up an appointment to meet with an approved application and at the foster parents convenience (we all have F/T jobs too). If you are interested please email Siamesekatdiva@gmail.com or text 817.891.3909 giving detailed information (name or tag #) of the interested feline(s) and we will respond back to you within 24 hours. For Serious Inquiries please go online to lostpawsrescueoftexas.org and fill out an adoption profile (under forms tab) and email it back to Siamesekatdiva@gmail.com. We give priority to completed applications. 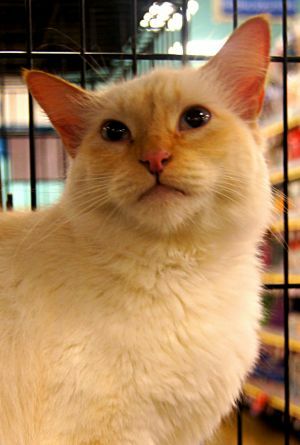 Tala is a pretty 1 year old cat who came to us pregnant with two precious white babies (Maui and Moana). Now that they are ready to fine their forever home, so is Tala. She is super sweet and very loving. She even enjoys belly rubs from time to time. Gramma Tala does like to play too and has yet to meet a toy she didn't enjoy playing with! *If you are reading this, I am still available! 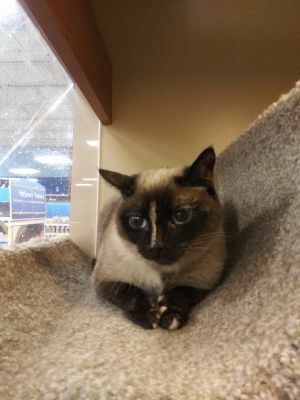 Please contact us to set up a time to see Gramma Tala as she is not at Petsmart Lewisville every weekend* The adoption fee is $150 for kittens up to 1 year old, and $125- $75 for adults (depending on age). The adoption fee covers FIV/FeLeuk testing (all cats must test negative to be adopted), 2 rounds of FVRCP and FeLeuk vaccinations, rabies, and (age appropriate) spay/neuter surgery (if not sterilized before they are adopted), deworming, treatment for ear mites (if applicable), nails trimmed and have been bathed. We also offer courtesy nail trims every weekend. Our associated vet list consists of 10 vets within the DFW area for your convenience. Lost Paws offers same day adoptions on the weekend (check our website for locations and times). We offer a Foster to Adopt (trial) program; half the adoption fee the day the kitten/cat goes home and the balance 2 weeks later. We do not ship our cats. Through the week, we will set up an appointment to meet with an approved application and at the foster parents convenience (we all have F/T jobs too). If you are interested please email Siamesekatdiva@gmail.com or text 817.891.3909 giving detailed information (name or tag #) of the interested feline(s) and we will respond back to you within 24 hours. For Serious Inquiries please go online to lostpawsrescueoftexas.org and fill out an adoption profile (under forms tab) and email it back to Siamesekatdiva@gmail.com. We give priority to completed applications.